If you thought the Marine and Coastal Areas Act was a hijack of democracy, it’s nothing compared to what’s coming. Next on the Maori-National government’s Maorification agenda is an all-out assault on the New Zealand Constitution itself. Once they’ve had their way with that, New Zealand as we know it will be gone. 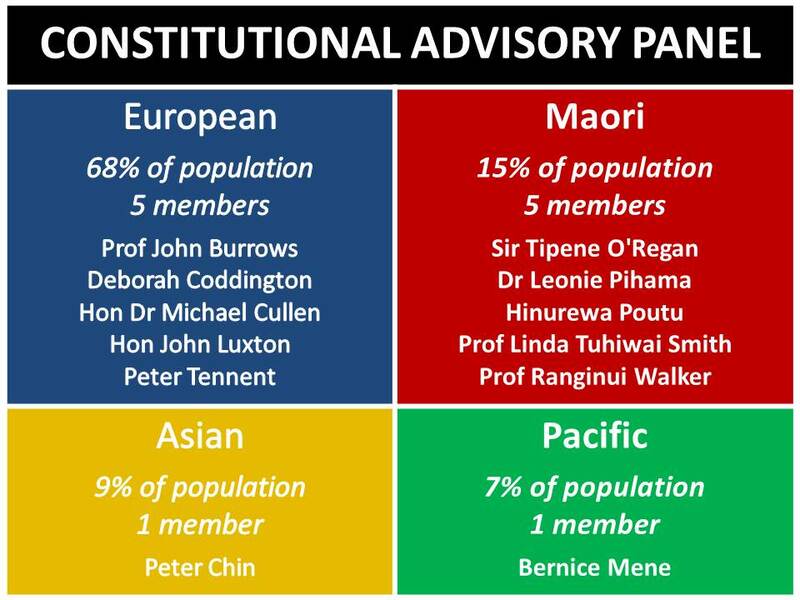 The Maorification of the Constitution began on Thursday with the naming of a wildly disproportionate Constitutional Advisory Panel. 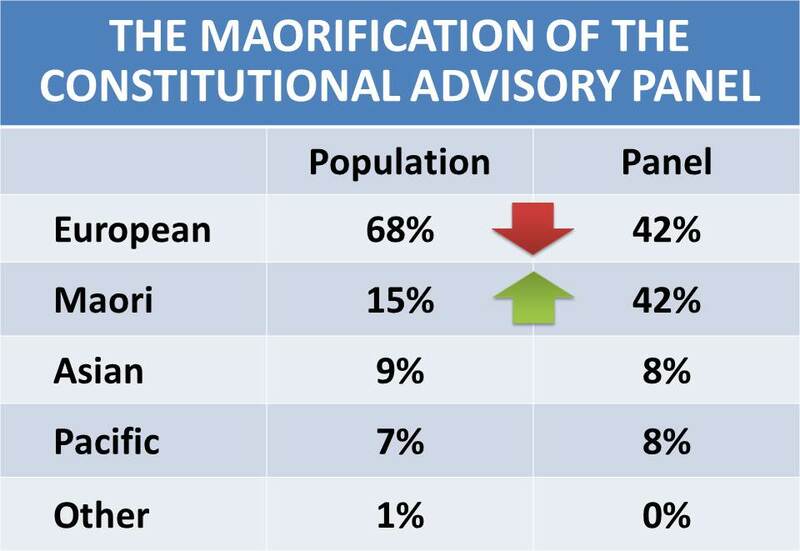 In a country where 68% of the people are European and 15% are Maori, the committee is stacked 50-50. A 50-50 split may be even. But it’s hardly fair. The only New Zealand population it remotely resembles is our prison population. What is the smiling tiger Pita-Peter Sharples up to? No doubt he’s planted a tame Pakeha or two in the panel to give him the crucial majority? Well, looking down the list above, I see two interesting names. First, Michael Cullen — my ‘Wastemaster-General’ in the Taxathon TV ad of 2005. This is the former finance minister who so loved his country that he quite deliberately booby-trapped the economy with a decade of deficits — just to make life harder for the incoming government. And how does the not-so-Honourable Michael make his living these days? Why, partly as Principal Treaty Claims Negotiator for Tuwharetoa. Doesn’t that smell a bit fishy to you? If Cullen is not tame enough, one of the other Pakeha members is former National minister John Luxton. The panel bio notes that Luxton has expertise in Crown-Maori relations, experience in co-management (as co-chair of the Waikato River Authority) and representing Maori interests. But at least former ACT MP and investigative journalist Deborah Coddington ought to be a safe bet, right? I don’t think so. See my UPDATE 3 below. The consitutional review is a condition of John Key’s uniquely unnecessary coalition appeasement (sorry, agreement) with the Maori Party. You know it’s going to be bad when Anthony Hubbard of the Socialist Star-Times tries to snow you that the newly-named panel is “unlikely to be more than a Mad Hatter’s tea party of unanswerable riddles and pointless in-fighting”. The government’s main agenda is obvious: to elevate the bogus version of the Treaty of Waitangi to the status of official sacred cash cow for their Maori con artist mates to plunder at will. But look how this lefty journo does his best to keep that news from you. First Mr Hubbard diverts your attention to the republican issue. He pretends that the real reason the committee won’t be looking at ditching the monarchy is that John Key doesn’t want to. The real reason, of course, is that the Maori Party doesn’t want to. Replacing the Queen could kill the golden Treaty goose. And we can’t have that. Then he tries to make you believe that the big issues for the panel will be the size of parliament, and the length of the parliamentary term. Some of the other subjects for the committee — the Treaty, Crown-Maori relationships and Maori representation — are contentious in theory but in practice many people find them boring most of the time. New Zealand voters tend to fall asleep when the word “constitution” is mentioned. Yawn, yawn, nothing to see here, move on. No doubt the Star-Times, Sharples and Obfuscator-General Finlayson will be pumping out lots of big, boring words to try and keep you comatose for the duration of this constitutional stitch-up. But I plan to be doing the exact opposite — stripping their bloated word-carcasses of their fat, and distilling from the layers of putrid gobbledygook their true meaning and hitherto-hidden agenda. You know where to come for the real truth. Sharples apparently thinks his Constitutional Advisory Panel is a ‘good mix’. Course he does. He’s shamelessly stacked it with a quarter more Maori and a quarter fewer Europeans than their populations warrant. Ngai Tahu leader Sir Tipene O’Regan and legal scholar John Burrows will lead a government appointed panel which is to lead public discussion on constitutional issues including the status of the Treaty of Waitangi. Panellists like Sir Tipene (who a friend used to know as Steve “before he became a Maori”. and who told a friend of a friend that he is Tipene “only in certain circles”) will undoubtedly try to lead the public. And when he does, I hope by then the public will be savvy enough to push back. I hope people like you will ask people like Sir Steve to show you proof that the Treaty is a ‘partnership’ that contains ‘principles’. Because they won’t be able to. Unless they’re written in invisible ink, there’s nothing whatsoever in the Treaty about partnerships or principles. Why not? Because they were conjured up in the 1980s out of thin air. They were the figments of the activist imaginations of a judge, Robin Cooke, and a prime minister, Geoffrey Palmer (who later regretted it, and who some say resigned because of the damage he knew he’d cause). Once Cooke and Palmer had cooked up this fake Treaty of Waitangi, it became much easier for guys like Tipene-Steve to extort money from you and me. There is only one place this panel will try to lead you: away from the truth. Vengeful Maori — tribes plotting utu for Ngapuhi’s musket massacres of the 1820s. Vengeful Froggies — French would-be colonisers bent on avenging the massacre of Marion du Fresne and his crew in 1772. Bad Brits — escaped convicts and other disreputables causing trouble in lawless Kororareka. Without the Treaty, the tribal musketeer-slaver-cannibals would have slaughtered and eaten each other to extinction by 1860. The Treaty deal was that the British got the country, and the Maori got the same rights as the British. By any measure, it was an excellent deal for the times. I’m working on a series of posts that will spell out, point by crystal clear point, what happened before and after the signing of the Treaty — and how various conmen have been distorting the truth ever since. But back to this poisonous panel. Who will speak for non-Maori? “An important part of the review process will be consultation with Maori, particularly on the place of the Treaty of Waitangi in our constitution,” Dr Sharples said. The most important part, I’m sure he meant to say. Indeed the five Maori members and one Maori employee certainly are. My question is: who will speak for the 85% of New Zealanders who are not Maori? And will their views count? And with the panel overloaded with Maori, guess what they’ll find? It will also consider whether New Zealand should have a written constitution and Bill of Rights issues. Course it would. Rigging your own panel is much cleverer than expecting a judge to do your bidding. Well, we can’t have people questioning us for ignoring expert recommendations (like the 2025 Taskforce), can we? But with Prime Appeaser John Key and Activist-General/Obfuscator-General/Appeaser-General (you choose) Chris Finlayson driving the Maorification agenda, don’t expect critical questions to be tolerated. And if Finlayson’s arrogance over the Marine and Coastal Areas Act is any guide — not to mention chair Tau Henare’s rude put-downs of submitters to the Maori Affairs Select Committee — don’t expect straight answers. One of my more abusive commenters has pointed out the difficulty of identifying by race, given that many of us are a mixture of two or more. Certainly, we know that all Maori are. So here’s an idea: Since we’re such a multicultural lot, why don’t we drop this preoccupation with ethnicity, metaphorically rip off our skins and set up a colour-blind state — with one law, and one electoral roll, for us all. We now find that Sir Tipene/Steve O’Regan is being sued by the Financial Markets Authority for his role in the Hanover Finance collapse. Is it OK for a man being sued by one government agency to preside over another government agency — especially one advising on matters at the very core of our national being? No Prime Minister, it’s not OK. I had puzzled at why the notoriously biased Sharples would include former ACT MP Deborah Coddington on his tame advisory panel. Was it to give the appearance of balance? Or is Deborah really a wet in dry’s clothing? “Yes, the English ripped off the Maori, too, when it came to getting them to sign the Treaty of Waitangi. Then we have this ridiculously saccharine account of Deborah’s dinner with the Turias. And I’ve no doubt the Turias are very warm, hospitable and genuinely caring people, as are most Maori. But Tariana is the leader of an openly racist political party. And Deborah is an investigative journalist. Does this totally uncritical restaurant review suggest to you that Ms Coddington can be trusted to fairly represent your wishes? Previous postWaitangi Tribunal unbiased? You be the judge. Unless the Constitution upholds individual rights and limited Government charged solely with protecting said rights its a farce and dark times are ahead. I’ve put up a link to your post at my site. This is a damn outrage. In some ways I prefer the previous government–at least you knew what they stood for. JA: You know things are bad when people start hankering for Helen. Thanks for linking KG. Do the the people of “mixed race” count as a number for two ethnicity? I suppose this panel really comes down to the propaganda typically forced down our throats in that the treaty is a “partnership”. JA: The blogosphere is a wonderful tool for countering that propaganda. The internet is the modern Resistance. We must use it to get the word out that we’re being conned. what’s the big deal there are mostly only Chinese, Indians and other third-worlders left here anyway – last white man out please turn off the lights. JA: Grant, I like the cosmopolitan society New Zealand has become in my lifetime. It was very boring in the cities with nearly all British-descended New Zealanders, and the food was dire. Now we get to mix with people from every corner of the globe, savour their food and learn from their experiences. All we need to make it fair is one law and one electoral roll for all. People who say that’s unfair on Maori should remember that Maori now have a $40 billion economy. That’s a bigger share of the New Zealand economy than their share of the population. Yet the bad stats remain. If Maori are not going to feed that money down to the people who need it, why keep shelling it out to the iwi elite and their lawyers? And to think my descendants came here to keep the peace between them, to literally stop them murdering one another. Obviously that’s were they would rather have gone.Well some of them at least. @viking Did you mean your predecessors? John your blog is becoming a must read for me. I hope the MSM pick up on your messages. Sadly unlikely as they are complicit in the Cons. Thanks Heyjude: I hope the MSM pick up my messages about the MSM! Well, if the psychos at Crusader Rabbit are on your side John, you can’t be wrong! They’re big fans of the views of Anders Breivik too, and look what he achieved. JA: And some of my readers make excuses for the baby-eater Te Rauparaha, who made Brievik look like a Sunday school teacher. And in your little table the population totals to 110%. Epic fail. JA: My failure was to trust the Ministry of Social Development, from whom I copied it exactly. Am trying to get to the bottom of it. Doesn’t change my point though. Maybe your failure was not reading the states carefully enough. JA: Welcome to the Epic Fail Club! I am really embarrased for our country if these are the viewpoints of some of our population. So glad that I don’t live in the world of fear as you seem too! JA: I don’t fear anyone. But I do resent being defrauded. Don’t you? John Ansell – you’re an idiot. The fact that you don’t check stats before posting them suggests that all of your content is questionable. I would have enjoyed reading your blog frequently however I suspect you are simply a sad sad sad sick little man with an axe to grind. Poor you. Get well soon. Carly, that was totally unfair name-calling on your part. In my opinion you need to think before you type. Everyone who has an opinion should be given a fair chance at speaking their mind. If you don’t like the content of someone’s blog, attack the blog, not the person. He was trying to read them through the red mist of hate. nom de plumes lets have some facts or cant you deal with those ? ( you haven’t produced too many facts yourself btw). The bickering is a sad distraction from some fairly incontrovertible facts. Namely that: (i) preferences given in custom and/or law to one ethnicity over and above that extended to others is the very antithesis of democracy; (ii) the constitutional advisory panel do not fairly represent the public over which they will have a major input in terms of future governance. It is yet another example of ‘due process’ being hijacked by those in positions of authority who will themselves stand to gain the most; and (iii) it makes about as much sense to obligate future citizens to the disputed terms of an agreement indefinitely, (and against the principles of democracy), as it is to either imprison me for a crime one of my ancestors might have committed or laud me for their successes. We actually need to start thinking with our brains not our bloodlines. Good posts from Marc and Denis. The whole fraud is shocking. We are being duped big time. However, it has just come to my notice that all might not be lost. I have just received a copy of a letter, part of which the author says, ‘Legally the Treaty of Waitangi has no standing today. The Treaty became null and void when the first signatory died, as there was no inclusion in the Treaty that heirs and successors were bound by the Treaty. As no such clause is written into the document; it is simply an agreement between Queen Victoria and the Maori Chiefs that signed the document at the time, nothing more’. Is this correct? If so, we might be able to fight the whole thing from the invented Principles and everything since. Let’s hope so. We are at a political watershed – we MUST win the battle for seabed and foreshore , and successfully resist Maori claims to water ( and air ! ), as well as attempts to incorporate Treaty misconceptions in the proposed new Constitution. If we don’t, I can forsee a situation where non-maori will be squeezed out and forced to emigrate, with a Mugabwe – style take-over of properties. We must insist that we are all kiwis now, with equal rights and obligations.We don’t want to see a kingdom of Tonga style hereditary aristocracy here. He iwi take tatou ! we are heading down a very slippery path by stealth and subterfuge….there is a real AGENDA here – I would love to be a fly on the wall in the Maraes – to hear what lies and vitriol is being spoken. What we need is a Nelson Mandela type person to stand up and UNITE the majority of the population – JA will it be you to unite us and get us motivated?? OMG Helen! Just a few days ago while my mind wandered around the issues I questioned that very point! I think it deserves further investigation Helen.Is the Treaty a form of contract? I concur with most of the recent sentiments posted. NZ citizens are totally over the Iwi and thier bulchy foot stomping. Like Tony I have been out collecting signature for the seabed and foreshore. People could not sign the forms fast enough and were grateful that someone was doing something. It impressed on me how gagged people feel on the Treaty issues. In my home town we have activists who are skilled at pushing around the council. They monitor everything the council does and stomp their feet at any opportunity. Numerous meetings are then held between the council and these activists to find a compromise or agreement. It is important for the activists to be difficult and create as many meetings as possible as they get paid to attend! I learnt recently that one of them recieves $500 per meeting! Now I must ask where the hell that money comes from? I’m not sure who could tell us about the Treaty not mentioning heirs and successors but maybe Ross Baker has some ideas on this. As far as I’m concerned the Treaty served its purpose when it was signed, bringing everyone under the one law. It should have been consigned to history long ago but instead they are trying to tease things out of it which just aren’t there. That’s why Geoffery Palmer invented the 5 new Principles and put them into legislation. And that’s where the fraud starts in my view. Surely he can’t mention these Principles and the Treaty in the same sentence. They aren’t the Treaty. Pretty much agree with most of comments. Would love to get back to the days when at school no-one seemed to notice any difference between different skiin colours and all played quite happily together. People need to take a visit to Opoutama near Mahia Peninsula and just see what devastation has been caused to what once was a beautiful beach and camping ground which many generations loved, both Maori and Pakeha. Things changed in the 70’s and many Maori started to be suspicious and since then the gap has widened slowly but surely. I for one am fed up with the Treaty and what it means to us now. Things would be a heap better if people treated people as they want to be treated and putting others first. Seems to me that with all the hundreds of Maori Trusts out there (many not well managed) this money should be used for all areas in NZ where we see needs – decent education, decent housing, good health system for all (not fragmented into Maori and Pakeha). What about all the other ethnicities in our multicultural New Zealand. It’s time to look beyond the oft-used ‘poverty’ blame and ‘sick’ children of all races and note that many homes are unhygienic eetc. The pioneers had it tough – worked hard in tiny log houses, no running water, working very hard on the land – yet their hygiene were often far better than what we see in many homes today. I say STOP all this gobbledeegook and PC stuff and drop being afraid to come out and say ‘enough is enough’ before it is too late. I agree with your comment Raewyn. It is time for a change and it is long over due. If we do not start pushing back now and demanding equal rights for all NZers and the abolishment of race based policies, we are committing our children and grandchildren to a miserable existence. As we have recently seen with the water issue, Iwi claims are becoming more and more extreme and it will not stop. I totally agree with you both, Raewyn and Trina. I find it very worrying that nothing seems to be halting these race based policies. It’s almost as though any complaints are pushed to one side and they continue on as if nothing is amiss and it’s all quite normal, when so many of us know it’s not, if comments in answer to polls are anything to go by. Also comments from social acquaintances. Everyone is leaving everything to the politicians and many of us know they are destroying our democracy and leaving a terrible legacy for the people of this country, if someone doesn’t step forward and do something. We need a charismatic leader to start things moving. I totally agree, Trina. I just wish the masses would rise up and say ‘Enough’!! I’ve been writing to politicians since 1995 and achieved zilch. They just don’t want to know so we have to find another way to get everyone moving. I just wish our wishy washy Press would take it on. Investigative journalism is sorely lacking here apart from the Ian Wisharts of this world. He is excellent but we need more of him. But i guess we cant afford to take time off work – not like those that do march using our hard earned tax $$$ !! Quite agree, especially about Ian Wishart. And he has never been sued either!!! Which means he must have been right in his investigations. Tony: in the words of the Little River Band, “Hang on — help is on its way”. Winston is starting to make some very good comments on the fake Treaty being incorporated into our Constitution. Let’s hope his comments get reported widely and not swept under the carpet. It’s quite unbelievable how little we hear on this matter when it is so important. Helen, While most contracts/agreements between Kings and Queens etc have “heirs and successors”, the Tiriti does not. It was a contract between the named chiefs and named Queen Victoria so when they died I believe it would have died with them. Not being a lawyer I do not know the legal possition on this but hopefully someone out there can. As the Tiriti’s sole purpose was to cede soveriegnty to Britain to form a government to make laws, there would be no need for it after the government was formed. Queen Victoria’s Royal Charter set up the Government in New Zealand on the 3nd May 1841. I believe the Tiriti had done it job. This was sealed when the chiefs shook Hobson hand after they signed the Tiriti at Waitangi with the words, “He Iwi tahi tatou – We are now one Nation”. Interesting, Pita Sharples conned John Key into allowing him to sneak off to the United Nations to sign the Declaration on the Rights of the Indigenous People, telling the UN, “that Maori hold a distinct and special status as the indigenous people, or tangata whenua, of New Zealand”, when New Zealand does not have a definition of the Indigenous People. He then conned Johnny again into letting him set up a Constitution Advisory Board of his mates to re-write our Constitution. Sharples seems to have forgotten his tangata maori and Pakeha ancestors agreed in 1840 to, “He Iwi tahi tatou – We are now one Nation”. Time to honour your ancestors wishes Pete!